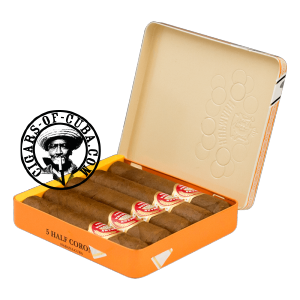 The H. Upmann Half Corona was launched by Habanos at the Upmann Gala during the Habanos Festival in Cuba in 2011. This small H. Upmann cigar is a new vitola (44 ring gauge x 90 mm length). Created with the modern aficionado in mind, the focus is on enjoyment of the blend. Habanos created this short-sized Cuban cigar in view of the limited time and scarcity of places available to smoke these days. Short in size it may be, but it never gives up the fullness of sensation that one expects from a true Habano. A 20-30 min smoke, this cigar must be smoked at a regular, gentle pace to avoid any over heating to the mild tobacco. This Cuban cigar offers a perfect alternative smoke for the afternoon, but will smoke especially well when out and about. The Half Corona makes for a very easy smoke and can be considered the perfect introduction cigar for any smoker embarking into the world of the Habano. The H. Upmann Half Corona presents a smooth to medium fortaleza, being very aromatic and of a balanced flavor. Watch out for a wicked finish. The power comes all of a sudden and catch you off guard.